The new XPand NFC expansion pack for the XP3300 Force ultra-rugged phone is designed for workforces in the security guarding, commercial cleaning services, mass transportation, field equipment maintenance and domiciliary healthcare industries. Sonim has launched an NFC upgrade for the XP3300 Force, the ultra-rugged hansdset that holds the Guinness World Record for the world’s toughest phone. The XPand NFC pack adds NFC tag reading capabilities to the XP3300 and is designed for workforces in the security guarding, commercial cleaning services, mass transportation, field equipment maintenance and domiciliary healthcare industries. Sonim is building a network of partners who will provide workforce management applications compatible with the device, allowing businesses to collect real time business intelligence and monitor the quality of service delivery. Key applications are expected to include guard tour verification, proof of activity and real time attendance reporting, says Sonim, while the combination of the NFC expansion pack with the phone’s two megapixel camera and LED flash will also enable teams to report critical job site damage in real time with photo evidence. The XPand NFC is a drop-in replacement for the handset’s battery cover and is the first of a range of modular expansion packs that the company plans to make available for both current and future phone models. “The XPand system will enable Sonim to address an ever wider range of workforce management solutions – with portability, robustness and cost of ownership that traditional rugged handheld computers can’t match,” says the company’s Sanjay Jhawar. 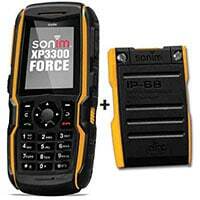 Sonim also offers a rugged phone with built-in NFC capabilities, the XP1301, which was launched in September 2011.